New Zealand get the chance for revenge against South Africa on home soil this weekend in the first Tri-Nations Test staged at Waikato Stadium in Hamilton. The All Blacks have a 100% record at the ground; having defeated Italy, Argentina, Wales, Ireland and Canada, and it will also be the Springboks' first Test appearance in Waikato. The Boks have history at the stadium's predecessor, Rugby Park, where a tour match against Waikato was abandoned amid anti-Apartheid protests in 1981. Protestors stormed on to the pitch and forced officials to end proceedings. South Africa's victories over the All Blacks earlier this season took their all-time stats to 32 victories, with New Zealand having claimed 42 and three Tests having ended in draws. 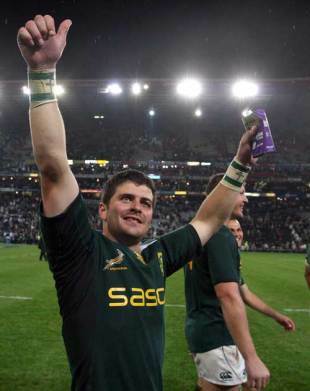 Morne Steyn's 31 point-haul in Durban last-time out eclipsed Jannie de Beer's scoring record against the All Blacks, as well as smashing Andrew Mehrtens' Tri-Nations record of 29 points.